Before we discuss the contents of the joint declaration of the third Kim-Moon summit, let’s see some of the highlights of the event. First, the composition of the delegation was meaningful. By and large three groups of people were included. First group was composed of policy decision makers including ministers and the key staff of the Blue House (Korean White House) in charge of foreign affairs and national security. The presence of this group was intended to show Moon’s strong determination to carry out the summit agreements. The second group represented the business world represented by the heads of Samsung, Hyundai, LG, SK and other Chaebols. It was the first time that most of the heads of Chaebols (family industrial conglomerates) visited North Korea. Their presence was intended to show to the world in general, and, to North Korean in particular, the possibility of Chaebols participation in North Korea’s economic development. The third group is composed of the heads of two liberal political parties, people representing the world of arts and culture, local government, academics, sports and NGOs. This group was given the task of exploring North-South cooperation in their respective field of interest. In short, the composition of the delegation showed clearly Moon’s roadmap of North-South cooperation and his strong intention support it. The issue of denuclearization was an important agenda, but this issue was something that should be solved by Washington and Pyongyang. What Moon hoped to get in connection with this issue was Kim’s more concrete and practical commitment to the denuclearization. Moon got it. There are several other highlights to be mentioned. First, when the Moon’s plane arrived, Kim Jung-un and his first lady waited at the airport; this was unusual; it had never happened before. Second, Moon and Kim exposed themselves in an open car and greeted the crowd of one hundred thousand people standing and waving the flags of the Korean peninsula along the road leading to Pyongyang. This was a first time event in North Korea. Moon stopped the car and shook hands with the crowd. The amazing thing was that there was no V-form security display by North Korean security team seen during the Panmunjom summit on April 27th and the Singapore summit on June 12th. These events seem to show two things. They showed how North Korea highly regarded Moon’s role of go-between for the solution of the nuclear crisis. Moreover, Pyongyang was eager to show the world that North Korea was a safe place to visit and to live. There was another thing to mention. Throughout the three – day event, Kim Jong-un acted as if he were a little brother of Moon Jae-in who is, of course, much older. Such behaviour of Kim showed clearly that he was not an “arrogant dictator” (as portrayed by the Western media) but a good Confucian man respecting the elders. Kim has shown that he was a humble man. It is very important to point out also that Kim wished to show to the world that North Korea is not what it was; it is now a country where people want peace and they can pursue their happiness in daily life like any other people in the world. What also came to my attention was what happened in the evening of September 19th. Moon and his whole delegation were invited to a mass gymnastic show. There were 150,000 people including children and young people; they displayed unbelievably high level of perfection in their athletic and artistic performances. Moon was given a chance to speak for two minutes. “We have lived together for 5,000 years but separated only for 70 years. I urge you to end those hostilities and take a big step toward unification”. When Moon finished his speech, the huge crowd shouted in one voice “Long Live!”; many cried; they clapped hand standing for long minutes. Moon’s short speech hit the core of the hearts of Koreans and perhaps the world, because reunited peaceful Korea could mean the end of starvation of North Koreans and the end of fear of war and violence in both Koreas. What Moon said was, for all practical purposes, his declaration of the end of the bloody Korean War and hope for the peace and prosperity on the Korean peninsula. Part 1. This part deals with the plan of demilitarization of the Korean Peninsula. 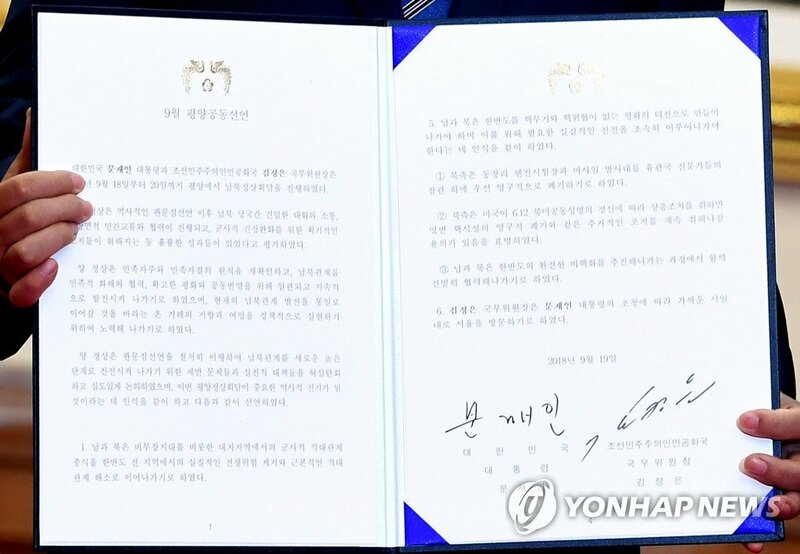 It has two sections: the implementation of the 4.27 Summit Declaration of Panmunjom and the creation of a joint military committee designed to insure the implementation of the military agreement. The military agreement was signed by respective defence ministers on the same day (September 18) as the main declaration. The military agreement shows that there will be a buffer zones on land, sea and air within which no major military activities are allowed. On land, there will be the Military Demarcation Line (MDL) within Demilitarized Zone (DMZ). The Agreement stipulates that within the MDL, hostile military activities such as artillery exercises will be forbidden. On sea, both on the east coast and the west coast, there will be buffer zones of more than hundred km of length. Similarly on air, there will be air buffer zones within which no military exercises will be allowed. In addition, at the DMZ, 11 guard posts will be pulled out. Finally, the Joint Security Area (JSA) will be disarmed after the removal of mines. The messages given by these agreements are clear; neither side wants war; they want to be free from threatening dark clouds of hostility. These agreements are telling to the world that there will be no more war in the Korean peninsula. They also mean a warning to Washington “Do not start a war against North Korea; South Korea will not participate in such a war!” These agreements may make the Washington hawks think twice before contemplating any dreadful hostile actions. Part 2. This part is concerned with North-South economic cooperation. It has four sections: east coast and west coast railway connections; reopening of the Gaesung Industrial Complex and Mt. Gumgwang resort facilities; North-South environment cooperation with emphasis on the forest industry; and North-South cooperation for epidemic disease prevention. Most of these cooperation activities are not possible because of the US-led UN sanctions. However, both sides showed a common vision for eventual cooperation. The leaders of Chaebols met with North Korean team in charge of economic affairs. One of the outcomes of those meetings was that South Korean capital and technology could come to the North when the sanctions will be lifted. The North-South economic cooperation is, perhaps, as important to South Korea as it is so to North Korea. The potential economic growth of South Korea seems to have hit the ceiling; the rate of the growth of its exports has been declining since 2010; the annual rate of its GDP growth is below 3% for years; the rate of under-employment is as high as 14%. The situation is so bad that there is a risk of repeating the Japan’s experience of two – decades long economic slump. Korea has been relying, for its economic growth, heavily on exports of two groups of goods, namely, electronic products and transport equipment (cars and ships) representing more than 85% of the total value of export. These products are mostly produced by two Chaebols. The trouble is that the Chaebols are no longer competitive. In 2017, the export of ships fell by more than 50%. Korea needs to diversify not only the goods and services to export but also the producers of these goods and services. Korea needs to export less technology intensive goods and services produced by large firms which do not create as many jobs as the small-and medium-sized firms (SMEs) create. Korea needs to export more labour intensive goods and services produced by SMEs and this is possible through the combination of South Korea capital and North Korean rich natural resources and well disciplined and low-waged labour. Years of experiences at the Gaesung Industrial Complex prove the benefits of this approach..
Part 3. This part deals with humanitarian issues, namely, the reunion of separated families. There are about 55,000 separated families in South Korea. South Korea will open a permanent office to facilitate the family reunions and introduce the use of videos for on-line meetings. Part 4. Here, numerous areas of non-political and non – military cooperation were identified. One example was the formation of North-South integrated sport teams for the 2020 Tokyo Olympics and a joint sponsorship of Summer Olympics of 2032. 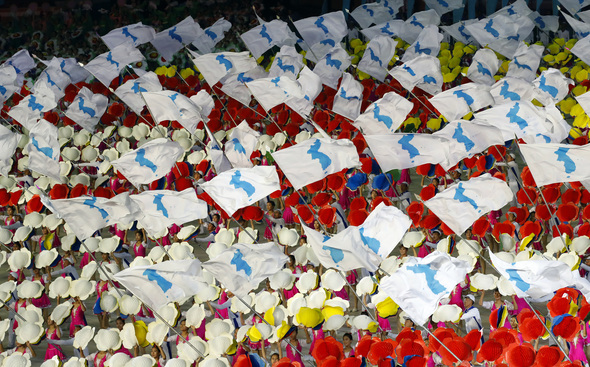 The famed North Korean Samjiyon Musical Group will visit Seoul in October. Part 5. This section is the most controversial part, for it tackles the thorny issue of denuclearization. It has three sections. The first section says that North Korea will permanently dismantle the Dongchang-ri missile engine-test and launch platform under the verification of experts from relevant countries. The second sections says that the North will dismantle permanently the Yeongpean nuclear facilities as the US takes the corresponding measures in accordance with spirit of the June 12 US-DPRK joint statement. The third section states that the North and the South will closely cooperate in the process of pursuing complete denuclearization of the Korean peninsula. Part 6. Chairman Kim will visit Seoul but Moon said if possible before the end of 2018. This means that the North will have to show expected progress in denuclearization before the end of 2018. The joint declaration conveys some important messages. Second, both sides have made it clear that there should be no war on the Korean peninsula. This agreement has nothing to do the denuclearization of North Korea. In fact, the two leaders have declared the “End of the Korean War”. I think that Washington should pay attention to this part of the joint declaration. True, this could raise the question of the justification of the presence of GIs in South Korea. But it appears that the North could accept the presence of American forces on the Korean peninsula. Third, the North and the South have declared a nuclear-free Korean peninsula. In other words, the North has reiterated in front of the South and, in fact, the world its firm intention of denuclearization. We must remember one thing; it is by no means easy for the ordinary North Koreans to accept the denuclearization, for they gave up so many things to produce nuclear weapons. Yet, they “say”. 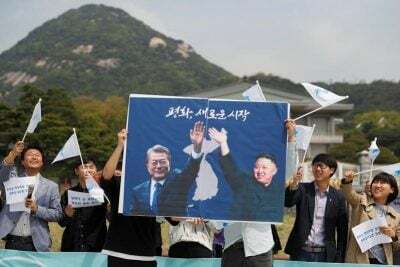 Moon Jae-in told the crowd of 150,000 at the athletic and artistic show: «We shall have nuclear free county!» the whole crow shouted and clapped hands to show their agreement. The message is this; the North Korean people accepted denuclearization of the Korean peninsula; it means that they are ready to justify decades of sacrifices they had to endure for the development of nuclear arms; it means also that they no longer feel insecure even if they no longer have defensive nuclear arms. One thing is sure is Kim’s strong desire to denuclearize his country. He would have even suggested that he would complete denuclearization before January 2021, the end of Trump’s first term. If so, then, it is now up to Trump to do something. It appears that Moon will give him something meaningful related to Kim’s plan of denuclearization, something which was discussed between Moon and Kim but something which has not been revealed because it is concerned with Trump-Kim relations. But, I have doubt about the usefulness of that something, because, Washington would say “It is wonderful, but not good enough!”. The real question is whether Washington really wants denuclearization. It is probable that Trump wants it. But, it is more than possible that the Washington hardliners do not want nuclear free Korean peninsula, because the North-South tension is useful for weapon sales and the China containment strategy. There is another group that does not welcome peace on the Korean peninsula; it is the group of South Korean conservatives. I have a message for these groups. There will be peace whether these war-promoting groups like it or not. If there will be no more war, then there is no reason why the Washington elite should not accept Kim’s denuclearization plan. It is about the time for Washington military-security elite to give up its idea of taking advantage of the tension on the Korean peninsula and cooperate with Trump for the creation of permanent peace on the land of morning calm. Mr. President Trump, now, you have a good chance to produce and present a historical gift of peace to the humanity! South Korea’s President Moon Jae-in and North Korean leader Kim Jong-un held summits in Pyongyang from September 18th to the 20th. The two leaders reaffirmed the principles of self-reliance and self-determination of the Korean people and agreed to consistently and continuously advance inter-Korean ties for reconciliation, cooperation, peace and joint prosperity. They also agreed to exert joint efforts to realize, through policies, the people’s aim and hope for improved inter-Korean ties to lead to unification. Professor Joseph H. Chung is co-director of the East Asia Observatory (OAE) – Study Center for Integration and Globalization (CEIM), Quebec University-Montreal (UQAM). He is Research Associate of the Center for Research on Globalization (CRG).